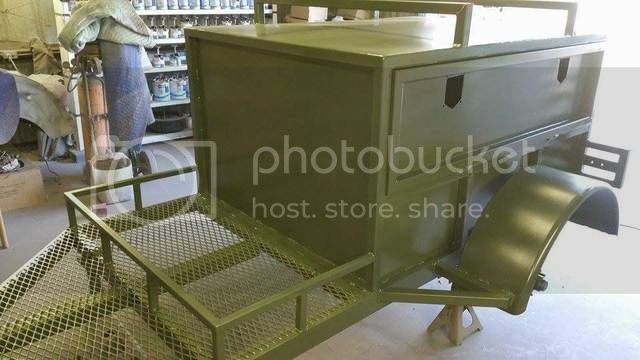 Here is a link to a really good write up of the build of the camping trailer. There will be extensive media coverage of this when completed and at the event. Thank you, great program! Big supporter of the Wounded Warrior Program. The Wounded Warrior Project has become, in the words of those it’s targeted for legal action, a “bully,” more concerned about its image and increasing the size of the organization than actually providing services to wounded warriors. “They do try to bully smaller organizations like ourselves... They get really territorial about fundraising,” said the president of one charity with the name “wounded warrior” in their title. The Keystone group was forced to spend more than two years and some $72,000 in legal fees to defend itself from the legal actions of the Wounded Warrior Project, which brings in annual revenues of close to $235 million, according to the outfit’s most recent tax forms. “That’s money that we could have used to pick up some homes in foreclosure, remodel them, and give them back to warriors. We spent that money on defending ourselves instead,” said Keystone Wounded Warriors Executive Director Paul Spurgin, a Marine Corps Vietnam War veteran. How does the Wounded Warrior Project spend its donations? The Jacksonville charity – founded a dozen years ago in Virginia – lists on its tax return the salaries for its eleven executives as $2.2 million. That includes a base salary to CEO Steve Nardizzi of $375,000. The charity also lists fundraising expenses of nearly $32 million. Those figures are, in part, responsible for lower grades from “Charity Watch” and “Charity Navigator,” two of the nation’s three main charity-checking organizations. According to numerous warnings from individual watchdogs in the LinkedIn group discussion, WWP doesn’t actually perform any services for wounded veterans. Instead, they take in hundreds of millions in donations, keep tens of millions for themselves, and donate a portion to small local charities that actually have programs and services for veterans. WWP takes the rest and is either uselessly hoarding it or carelessly gambling it on various financial investments. Either way, the money is not making its way to veterans. At last count, Wounded Warrior Project is sitting on $175.5 million - more than the total amount the charity spent on veterans in all of FY2013. I don't believe the WWP supports vets in a meaningful way. Instead they sue smaller organizations and pay their board members exhorbitant salaries. Just using the words "wounded" and "warrior" in a flyer will get you a nasty letter from their attorneys. I could be wrong Randy is very capable of speaking for his self,but he was not targeting you per say. His post was educational to You or any other person who donates to the Wounded Warrior program.. Thanks buddy. You are correct. I did not mean to lash out at anyone. It's just that I know of the WWP draining local charities dry and forcing them to pay up for using the wrong words or the wrong silhouette in their flyers. If you use a silhouette of a soldier carrying another soldier, they will sue you. Even if the silhouette looks nothing like the their copyrighted design. The Keystone Wounded Warriors logo is also a silhouette of soldiers, but shows one dragging another across the ground. In a federal lawsuit, the Wounded Warrior Project declared it "has suffered irreparable damage to its business, goodwill, reputation and profits" because of the Pennsylvania charity's logo. jmac313 wrote: Thank you, great program! Big supporter of the Wounded Warrior Program. Thanks man for supporting the real heroes. Please consider directing some of your generosity towards ANY local grassroots organization that doesn't have a bunch of TV commercials and huge overhead. The local VFW, various veterans organizations at the local level will all put more money and support where it is needed. There are many combat veteran motorcycle groups that provide escorts at military funerals. You can see your support at work with your own eyes. We work closely with the Military Order of the Purple Heart to provide children of Wounded a Christmas to remember with the Purple Santa event. MaxGravy and his beautiful wife are key volunteers with this great group. 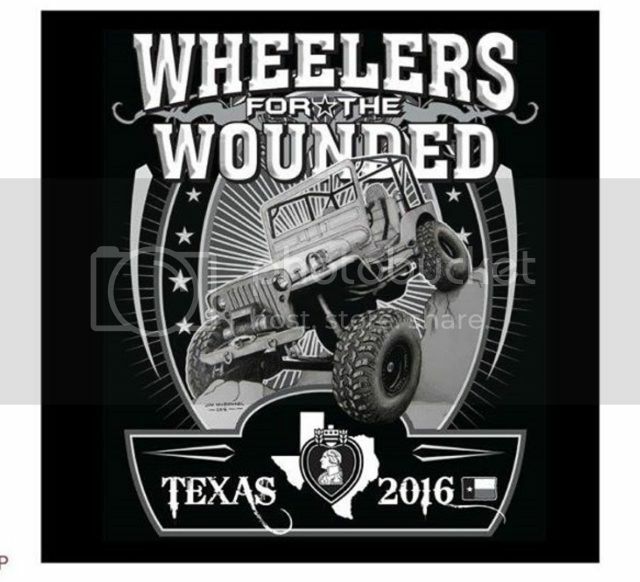 Wheelers for the Wounded Texas, WFTW-TX, is one of those types of organizations. ALL volunteers and offroading enthusiasts just hanging out with wounded veterans and getting to know them and helping them get out away from the hospital and rehab. Agai, thanks for supporting our wounded. I dropped off the original 18x24 drawing at Anchor Printing this past Friday. This is going to be on the official T-shirt, koozies, stationary, and possibly some silver bars . 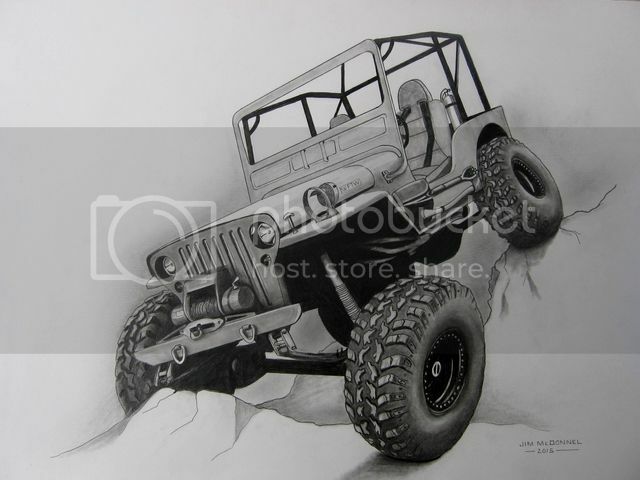 It is a rendering of an older flat fender military Jeep with modern suspension and tires. Combining the old and the new. Just saw the release for the 2016 Wheelers for the Wounded shirts. Gonna be really cool seeing my art work on the backs of over 1,000 people. Just more support for what has already been mentioned. Yellek wrote: Just more support for what has already been mentioned. I saw that on CBS last night. They should be ashamed. Found this on CNN... Shameful. Two former of employees, who were so fearful of retaliation they asked that CBS News not show their faces on camera, said spending has skyrocketed since Steven Nardizzi took over as CEO in 2009, pointing to the 2014 annual meeting at a luxury resort in Colorado Springs. "He rappelled down the side of a building at one of the all hands events. He's come in on a Segway, he's come in on a horse,” one employee told CBS News. 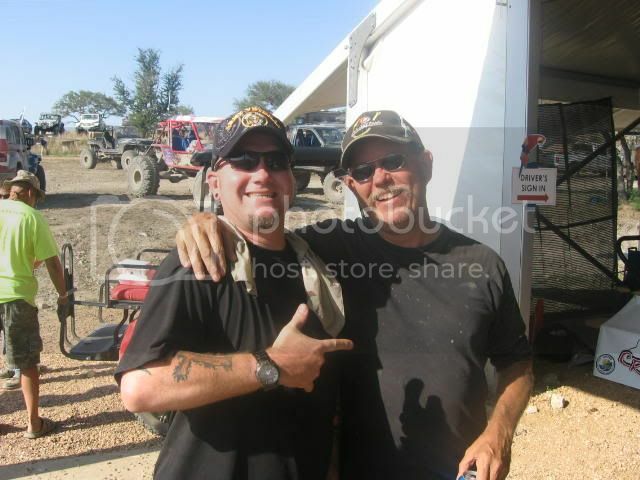 Back in 2011 at the Wheelers for the Wounded event, I had the opportunity to meet and hang with a really cool warrior. Ryan had just recently returned from a deployment in Iraq and came out to the event not knowing what to expect. I saw him kinda hanging out on the sidelines and introduced myself. 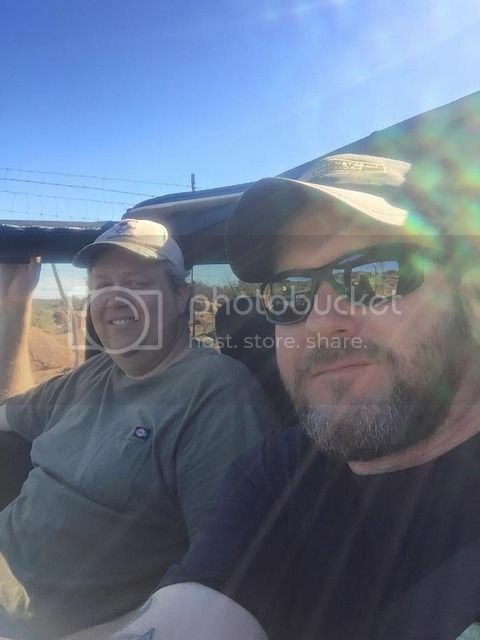 We talked a while and wound out taking him out on some trails in Dan's (Stouttrout) Jeep. He rode with me and I learned the extent of his injuries. PTSD seemed to be his biggest concern. Here I am hanging with Ryan....he is the guy on the left. A few months later, we lost ALL contact with Ryan. He had been corresponding with Dan and I via email, Facebook, and I had talked with him on the phone a few times. Then, it was like he had vanished. We feared the worst. Then in late 2014 we found him again. He has been doing so much better. He came out and brought his beautiful daughter, Fiona, to the event in 2015. 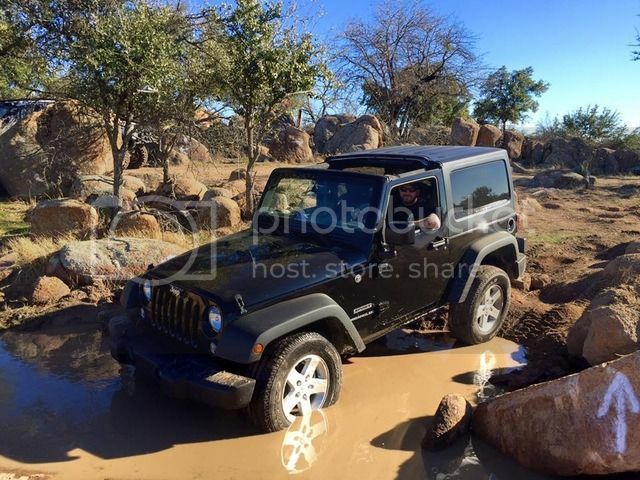 Now, Ryan went and bought a Jeep last week and is out wheeling with Dan this weekend. He is planning some upgrades and will probably be hauling around some wounded at the May WFTW event. This is the success of WFTW, to get wounded integrated back into some normal life activities. And then they in turn help the whole thing to come full circle......such a cool success story. And Dan riding along with Ryan. Awesome story Blue Angel. Thanks for sharing. Finally got the offroad expedition trailer painted. It looks awesome! The badging and trim work should be completed in a couple of weeks. McMillan Customs did an awesome job.